If you find yourself sinking, fear not! Learn what to do—and what not to do—to get out of quicksand. Though it's not quite as deadly as it appears in movies, quicksand can still throw an unsuspecting hiker for a loop. It’s nature’s version of pulling the rug out from under you, after all, and it's a rare enough occurrence that can cause even the most seasoned hiker to panic. Keep calm and trek on, adventure travelers, because we’ve got the 4-1-1 on what it is, how to avoid it, and what to do if you find yourself sinking in quicksand. Make yourself as light as possible—toss your bag, jacket, and shoes. Try to take a few steps backwards. Keep your arms up and out of the quicksand. Try to reach for a branch or person’s hand to pull yourself out. 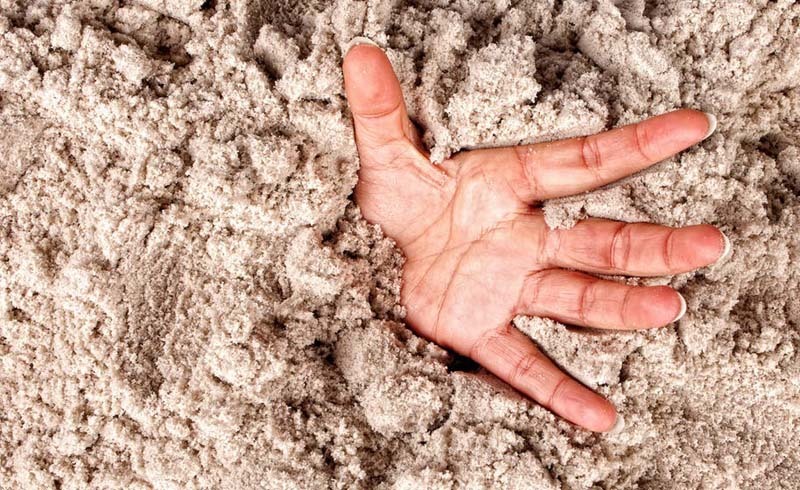 Quicksand is a bit of a misnomer, because it isn't always, well, sand—it’s any mass of sand, clay, or dirt particles that contains trapped water. The water turns the “sand” into a thick liquid mud that collapses under moving weight. This quicksand then re-solidifies, trapping whatever may have sunk into its depths. Unlike typical mud, quicksand can appear solid upon first glance. It is not until a person tries to step through it that this ground liquefies under his or her feet. Contrary to what you may have seen in movies, quicksand is not actually often found in the desert. Why? Because in order for quicksand to form, there needs to be water present. Flowing water underground agitates the sand, which can create quicksand. So quicksand is generally located near riverbanks, marshes, and beaches. Your best bet for surviving quicksand is to avoid it altogether. Awareness is key! Know Quicksand Danger Zones: Be on the lookout for quicksand around wet terrain near riverbanks, lakes, swamps, marshes, tidal flats, glaciers, or underground springs. Be extra careful after a large rainstorm. Eye Your Terrain: If water is bubbling up from below the ground, you may have stumbled upon some quicksand. Terrain with a rippled appearance is also a key indicator. Test Before You Step: Tap the ground in front of you with trekking poles or a walking stick. If the ground gives way under the walking stick, map another course. If you can’t avoid it, you have to escape it. Here’s how! Eliminate excess weight: Throw your backpack to the side, and take off your shoes, if possible. The lighter you can make your body, the easier it will be to extract yourself. Backpedal: Before you sink too deep, take a few quick steps backward to where the ground was solid. Avoid large lunging steps, because a straddled position will make it harder to maneuver if one leg gets stuck. Head Above Water: Keep your arms and head above the surface at all times. Use Your Resources: Assess your surroundings, and utilize any trees with reachable branches. Only grab them after you have achieved a safe position (back float or seated with legs above surface). Free Your Legs: Inch by inch, move your legs one at a time upward toward the surface of the quicksand. With every inch you move a leg up, allow a moment for the quicksand to fill the space it once occupied. Depending on how deep you have sunk, this process could take hours. Patience will prevail, while big movements will further liquefy the quicksand and reverse your progress.Use a Trekking Pole: If you have a trekking pole with you, now is the time to use it (arguably it was before you got stuck, but hindsight is 20/20!). Lay the pole on the surface of the quicksand, and lower your back onto it. This will help stabilize you while freeing your legs. Breathe Deeply: This will promote both buoyancy and calmness. Just as important as what to do is what not to do! Panic: Despite movie scenes to the contrary, people are not dense enough to sink all the way under quicksand. Keeping your wits about you will make the escape process easier. Heave-ho: Tempting though it may be, don’t ask your hiking buddies to yank you out of your sandy trap. Slow and steady movements will be more successful than pulling up against the powerful quicksand vacuum. Swing Your Arms: Back float your way out, don’t back stroke your way out. Keep your arm movements controlled, small, and close to your core to avoid further liquefying the quicksand. Front Float: Do not try to float out on your stomach! This increases the danger of getting your head stuck below quicksand. While we hope you steer clear of quicksand in your travels, we’ve got you covered with bags for plenty of other adventures.